Coming up this Thursday night will be the 40th running of the East Cork Road Championships. A full history of the event from its humble beginnings would require a guest article from John Walshe so I am just going to limit this to the niche group of 6 East Cork AC women who can claim they have worn the East Cork Road Champions crown. Going right back to 1986 Mary Curtin of Mount Uniake won the title for East Cork AC for the first time and also regained it in 1989. Eileen Prunty, our women's 10 mile record holder (60.04), was our 2nd winner of the event in 1988. We then had a barren spell for 7 years until Helen O'Callaghan stamped her authority on the race and won a unique triple from 1995 - 1997. On the turn of the millennium Claire O'Brien (Liams lovely wife) won the 2000 event. We then went through another quiet period for 12 years until club stalwart and current competition secretary Eadaoin O'Neill took the title in 2012. Fiona Santry, the current dominant force in East Cork road running, fittingly added her name to this bunch of East Cork AC legends then in 2018. The question remains who will take out this special 3000m road race this Thursday night April 25th in Ballynoe? Joyce Curtin (daughter of Mary from 1986 and 1989 vintage) won the race in 2004, 2006 and 2008 as a juvenile/Junior representing Glenbower AC. And Niamh Walsh who is a current club member won in 2008, alas representing rivals Youghal AC. Congrats to Donal on his podium and PB in his home 10 miler of Dromina at the weekend. In a hilly undulating course in poor conditions Donal ran a strong 61.12 for 3rd overall. 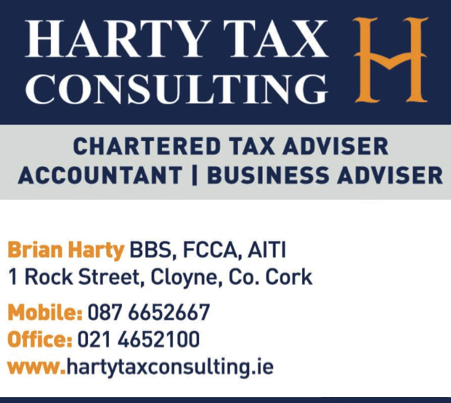 Ballintotis 4 was another amazing success this year and a lot of credit has to be given to the organisers for the massive effort for all the preparation and attention to detail to make it such an enjoyable experience for all involved. Thank you very much. 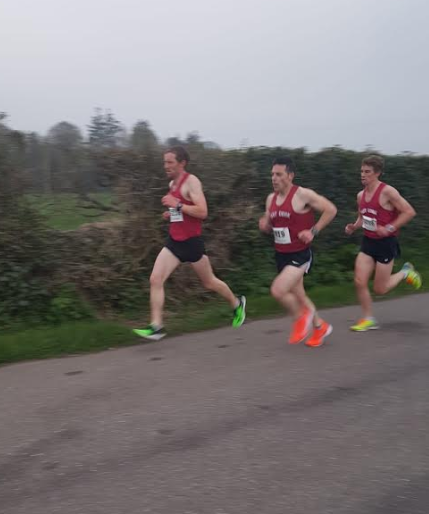 From an East Cork AC point of view it was a literal runaway success with the men taking 1st, 2nd and 3rd and Fiona winning the womens for the second year in a row. Kevin O'Brien was first home over the line in 20.13 and continued the East Cork winning streak, with Kevin O'Leary close behind and smashing his PB in 20.28. James was 3rd and continues his streak of finishing on the podium every year since the race began in 2010. The race started fast with Barry O'Donovan from Leevale pushing the pace through the sea of spectators outside the church before the race settled down as they hit the country roads. James and the two Kevin's formed a bunch at the 1 mile mark with Frank O'Brien (Midleton AC), Barry O'Donovan (Leevale), Kieran McKeown (Watergrasshill AC) and Damien Kennealy (Eagle AC) forming a chasing pack just behind. The easterly wind was tough for all between the 1-3 mile stretch and it was halfway along here that Kevin O'B made his move and broke away (after selfishly tucking in behind out of the wind for the previous mile). Kevin O'L pushed hard at the tight hairpin turn and made his bid for home with over a mile to go. He knows these roads better than anyone else and ran 4.57 solo for the last mile to take 2nd. James was 3rd then with Frank O'Brien 4th overall and first junior home next, also with a big PB in 21.00. Graham, relieved than his nemesis Niall Murphy decided not to race, ran 22.05 for 8th. We then had a big group very close together. Tim Crowley with a typically gritty and strong finish was 18th in 23.00. Stephen O'Brien with a another impressive performance and PB was 21st in 23.05, despite missing three week training in March due to injury. Jonathon Finn was one behind in 22nd in 23.11, a hearty congratulations to Jonathon too as he got engaged last week, no wonder he had a big smile before the race started (although that changed quickly after a sprightly first mile). Kenneth Kelleher made a return to the roads with a steady 23.22 and was quoted after saying "I'm just glad I didn't get chicked" after his tense battle with Fiona down the famous final 400m. Donogh was 31st in 23.29, Eric was 3rd O50 was 62nd, Jens on his road back form injury race a painfree 25.28 for 89th and Denis was 3rd O55 with a banjaxed knee so hopefully he will recovery quickly. 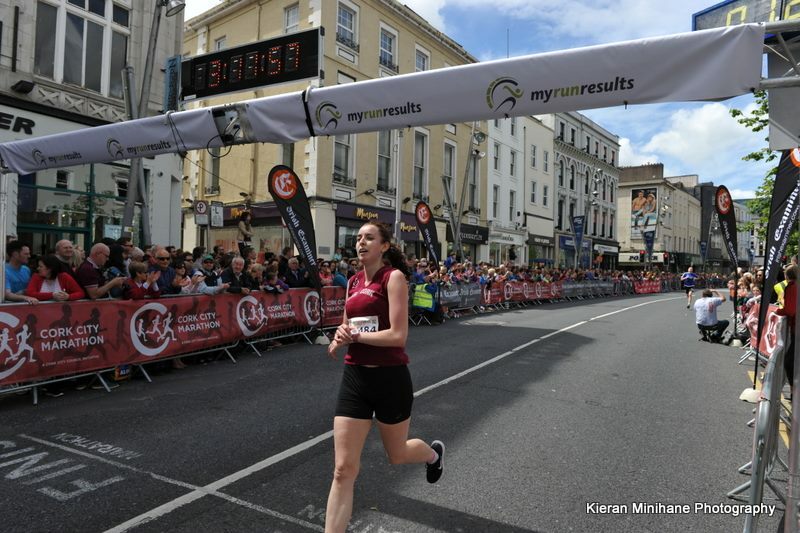 Fiona dominated the ladies for the 2nd year in a row with an impressive performance and another PB of 23.26, she had over a minute to spare over Ann Geary of Midleton. It just shows the level Fiona is operating at these days and she keeps going from strength to strength. Hopefully she got the honour this year of actually breaking the winners tape after last years finish line debacle..
Eadaoin in her fastest 4 mile since 2015 was 11th with 26.35, Michelle on her ever improving curve ran a staggering 4 minutes 21 seconds faster than her previous best 4 mile time!! Averaging a cool 6.45 Michelle finished in 27.03 and firmly established herself in the top 20 (16th). Eibhlin and Lavinia had a close battle with Eibhlin using her usual sprint finish to good effect in 32.19, while Lavinia record a PB of 32.40. - John Buckley Graded T&F, Wednesday 24th in CIT. This is a graded 1 mile race and is a great opportunity to run on the track. It cost €5 and starts at approx 8pm. It is open for all men and women. The range of finish times is large so really is a great chance to run your first track race and experience something different. Last year finish times ranged from 4.30 to 9 minutes and the races are graded so you run with people of a similar ability. - East Cork Road Championships, Thursday 25th in Ballynoe. This is the 40th running of this event and is usually well supported by the club. The womens race is 3k (and crucially only once up "that" hill) while the mens is 5 miles. - Leevale Open Sports, Saturday 27th in CIT. There are 800m, 1500 and 3000m races on the day and entry is online. Details on Leevales website (I dare not post that link on here...). James and Denis have spent a lot of time and effort compiling results from Munster and National championships from the start of time (well 1986). It is very well put together and shows the success the club has had over the years. Thanks to both for this. It might be a trip down memory lane for some people or a source of inspiration to others! - 1989: National Road Relays 3rd team - Missing 3 members of the team. - 1991: Intermediate Cross Country 2nd team - Missing one member of the scoring team. - 1996: Munster Cross Country Junior Men 3rd team - All missing! One wonders if we will have a junior mens or womens team compete again in the near future.. The file can be downloaded below and is also saved in the Club Records section. A few pale in comparison to the Club records largely set in the late 1980's/early 1990 but there was Tim's 2.21 marathon record in October to claim for the current generation.